Steve Kinniburgh believes Corby Town are “ticking along well” after they secured a 1-0 home success over Sutton Coldfield Town last night (Wednesday). 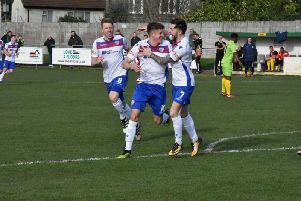 The Steelmen followed up a 1-1 draw at Cambridge City on the opening day of the Evo-Stik South League Division One Central season with a solid display at Steel Park as Connor Kennedy’s first-half header proved decisive. And while Kinniburgh felt his team deserved a more comfortable scoreline for their efforts, he was pleased to see them rack up their first win of the campaign. “So far, so good,” the Steelmen boss said. “I think we probably merited another two or three goals and had we got that second one, it would have relaxed everything and we probably would have pushed on. “That was the only thing lacking. Performance-wise I thought it was excellent, the atmosphere was great and everything is looking positive. “Defensively, I thought we looked really well. But the biggest thing we need to learn is each other. We had eight home debuts and they are getting used to the atmosphere, the pitch and each other still. Kinniburgh, meanwhile, reserved special praise for goalkeeper Dan George who produced an assured display between the sticks. The young stopper joined the club late on in pre-season but has performed well in the first two matches of the campaign, much to the delight of his manager. Kinniburgh added: The boy is growing into the position game-by-game, which is great to see. “He didn’t have much of a pre-season before he came in here so he was playing catch-up to everyone else. “But he was in here before everyone else and away after everyone else for the two or three weeks before the season started to get himself up to speed. Corby are back at Steel Park on Saturday when they take on league rivals Dunstable Town in the preliminary round of the Emirates FA Cup.